Description: All transistor/IC AM (SW, MW, LW), FM (66-73. 88-108MHz) superheterodyne powered from AC net 220V/50Hz. Ferrite antena, tape recorder connector, volume/bass/treble controls. Oval speaker, plastic cabinet, plexiglass scale. 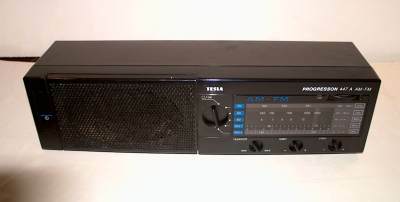 Last original Tesla receiver.